With Papa gone, I don't always get a lot out of mass. I go because it brings me a small measure of peace and well, you're supposed to. I've been sitting in the cry room because Pumpkin is not willing to sit still and is also quite loud. At times that small room can be really loud--it's to be expected with all the young children in there. Today, I was wondering whether it was worth it to even come to church when I can barely hear the homily. This thought came a few moments before Father Pedro lifted the bread and turned it into the Body of Christ. In that moment, I looked up at the TV (you can't really see the priest from this room even with the windows, so the priest is broadcast on TV) and almost all sound seemed to fall away. I could look and marvel at what was happening in peace. God answers even the unasked questions so well. I'm always inspired by the ladies of Real Learning, but their blogs lately have really revved me up. Many of them are in the process of planning for their school year and are posting them on their blogs. Elizabeth has posted here about her religious education plans for her preschooler. At the bottom of the post she has links to her previous posts. Check it out. They're thorough and really enjoyable. Oh, and very inspirational. 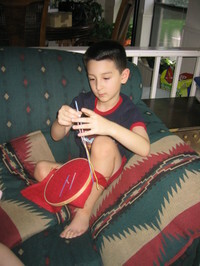 Dawn has posted here about hand work for little hands. I was really inspired. 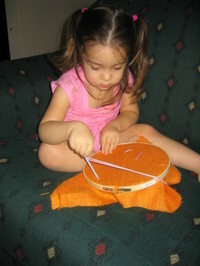 I took her idea of sewing with hoops, children's needles, and burlap. I went out and purchased the items and with minimal instruction let the kids loose. Even 3 year old Honey liked doing it. Thank you everyone for all the ideas. Keep them coming. We're temporarily living with my parents until our house is finished. This is the room we live in. That empty space between the girls on the left and the baby on the right is my spot. It's tight, but we love it. My children love having me sleep with them and sleep better at night. At various times throughout the night I will have all the girls snuggling up to me. Occasionally, even Brother comes down to the floor and snuggles. It's really heartwarming for me. Papa is not too keen on these quarters when he comes with us to visit my parents, but he endures without complaint. In Korea, people live in rooms smaller than this. The kitchen is detached as is the bathroom. The way to the kitchen and bathroom are usually not enclosed. The room is the living room and bedroom. The bedding consists of futon like material to lay down and blankets (either thick or thin depending on the season). It gets all folded up and put away each morning and pulled out every night. It's a different way of living. We do not put away the futon every day, but I do try to fold up the blankets. I don't always succeed. The kids have way too much fun sometimes dismantling the bedding, but I try not to get too upset (try being the operative word). Filed Under, "You're Kidding, Right?" Apparently, there's quite an uproar over the August issue of Babytalk magazine. I like this magazine because it gives such wonderful advice especially for the new mother. It's also great because it's free. I think the picture is beautiful and not at all sexual. I cannot believe people would consider that gross. It's just a picture of a breast in profile with a baby latched on. You should see the love in the baby's eyes. We had a cold front come through yesterday afternoon. There was thunder, rain, and lots of wind. It cooled us off to a balmy 97 degrees. I asked a dear friend of mine whether she was naturally cheerful. She replied saying it wasn't about being naturally this or that. It's about the consequences if you were not. Honey has been hounding me daily for a few days now. She wants to be joined at the hip. She's been especially needy, but I've not been there for her. I really needed this gentle reminder that I need to let go of self and be there for my daughter. I learned from a Father Corapi lecture that love is sacrifice. So, I need to cheerfully love my daughter despite my desire to be left alone. I need to let her sit on my lap even though my skin just needs no more contact. I love her and want her to remember me with warm feelings. Thank you, Genevieve. In my previous post I alluded to the wait time at the military pharmacy. It can be awful. I know that other places can take a long time to fill the order, but you can drop off the prescription (drive-thrus in some places) and then go back. This is how the pharmacy is run. After a doctor's visit, the doc will put into the computer system a prescription as needed. Usually it's for a sick child. So, I take all four kids to the pharmacy. With all the renovations going on here, it may mean we have to take a car ride or we have to walk clear across the parking lot. Then we get a number. On Wednesday, our number was 668. They were on 643. It made my heart sink. So, we stood and waited. Then a few seats opened up (who says soldiers are chivalrous? Certainly not the ones occupying the seats while we mothers with small children were standing). Then we sat and waited. And waited. And waited. About an hour later, the automated voice was calling 664. No one. Again 664. No one. Then 665. No one. Again 665. No one. By this point I was about to lose it. I wanted to shout out, "They're not here!! Move on to the next one!! Will you push the button already?" Now, as if that's not enough, once you get to the counter they pull up the prescription and then tell you to wait until they call your name. Finally, you receive your prescription with a cursory description of what you need to do. Usually, the counter people are quick and diligent, but I've been to some places where the people chitchat the entire time. I want to reach through the window and grab prod them along. At least the wait isn't as long as the ER at an Army hospital. That's another post. Don't get me wrong, I do appreciate my benefits and don't mean to complain, but it can really be hard to do with four kids where obviously at least one is really sick enough for a prescription. And, I can't even distract the kids with a walk through the toy section. Lissa at The Lilting House asked how we military wives opened hard to open lids without our husbands home. She received quite a few answers. I mostly bang on the lid with a knife and it loosens it somehow. This post made me think of what I miss having my husband gone besides the normal husbandly companionship. I miss him taking the garbage out before garbage day. I'm always leery of going out at night to do that so I would wait until the morning of trash day to do so. Well, sometimes I would be too late. I miss him taking my car to the gas station to fill it up. I miss him watching the kids so I can shop for shoes. Who can look at shoes when yelling at the kids to stay close corralling the kids is priority. I miss calling him and asking him to pick up the prescription for the sick kid so I don't have to wait for over an hour at the military pharmacy with all four kids. So, Lissa, thank you for making me think of all the wonderful things my husband did to make my life easier. On Sunday, 4 year old Joshua Schmiedicke died when he was run over by his family's SUV. The details are on Danielle Bean's blog. May God grant some peace to your family during this time. Please check out Danielle's blog. Also, they are asking for donations for a new vehicle. As you can imagine, just the sight of that car must be difficult. Pumpkin loves to run around naked after her bath. I indulge her. This time she wanted to climb.